Please add this item to your purchase. This is the exact hat you will receive! This is my "morning glory" lavender/purple hat. One of a kind! Large and Lush Beautiful Shabby Chic Floppy Hats ! NEW ITEM IN MY SHOP AND WILL BE DESIGNED ONE OF A KIND! Large and Beautiful Flower Included, Many of my flowers are hand dyed! It is ready for your monogram! The bow shown is a 3 inch grosgrain ribbon with lace sewn as a double layer. This lace has gold trim that just sparkles! 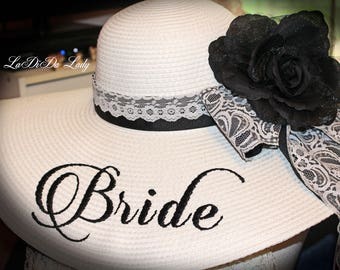 The hat band also has a double layer of grosgrain ribbon with a cotton floral print sewn for contrast. The flower is a lush and large peony style with a pin/alligator clip on the back. 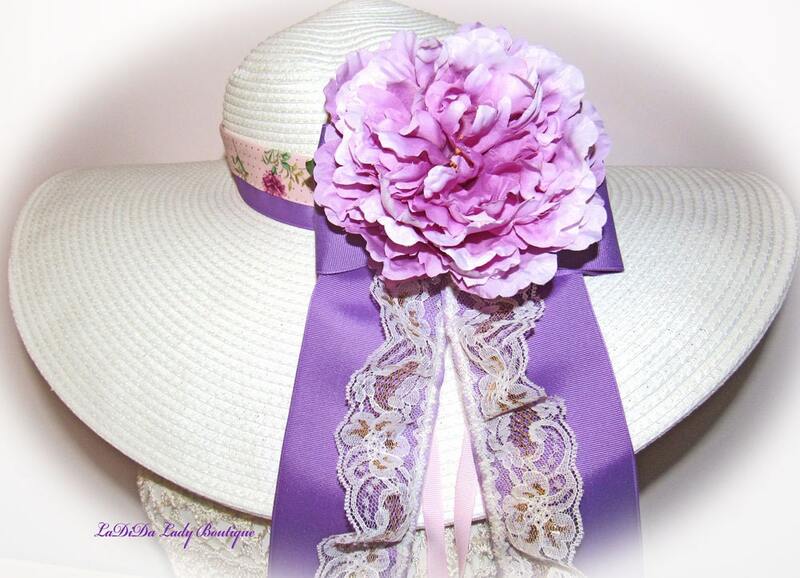 The hat band, bow and flower are all removable or repositionable. Makes this hat very adaptable! Lovely Wide Brimmed Floppy Sun Bonnet - Gorgeous & Elegant! Monogrammed with 3 letter monogram . (Only letters, no picture designs are suitable for these Hats). Great for Weddings, Bridesmaids, Derby, Sun Bonnets, Shopping! Please be sure that some monograms are meant for 3 letter monograms only since they have no lower case. Name monograms have a lower case. I have posted sample pictures. Send me your monogram font style choice along with thread color. so be sure to & check your conversations page! Your delay in sending approval of your preliminary picture may delay shipping. Payment is due within 3 days or item may be relisted. Shipping by Priority mail only with confirmation :) If using paypal, we ship to Paypal verified addresses only unless other arrangements are approved prior to shipping and purchase. Shipped within 1 week after your design approval. 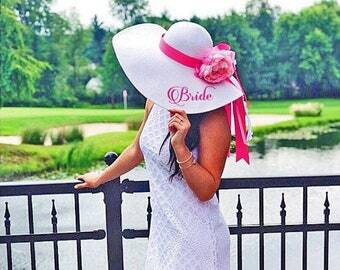 Refunds are not offered because once these hats are stitched, the monogram cannot be removed, therefore, please review your monogram before approving it. I WILL combine shipping for multiple hats. Please send your zip code for quote!